Day Nine was our last day on the island, and it was quite fitting to still write this last entry while resting inside the condo’s master bedroom. Geez, where do I begin? I guess let’s start with what we’ve done during our last day, and I’ll cap it off with my takeaway. What do I mean by takeaway? With my new job, I have to give lots and lots of high-level executive presentations, and each slide that I create has to have a takeaway. Basically, what’s the key point that you want to leave your audience with? Get up, guys…chop, chop, chop! I attempted to wake up our 4 little sleepy heads at 6am, it was a valiant effort. We planned a lightweight day since we had a 9:40pm flight to catch tonight from Kahului Airport back to LA. As I’ve said before, I like red-eye flights, we get to sleep during the flight, and in the morning, we’d be ready to tackle the rest of the new day. 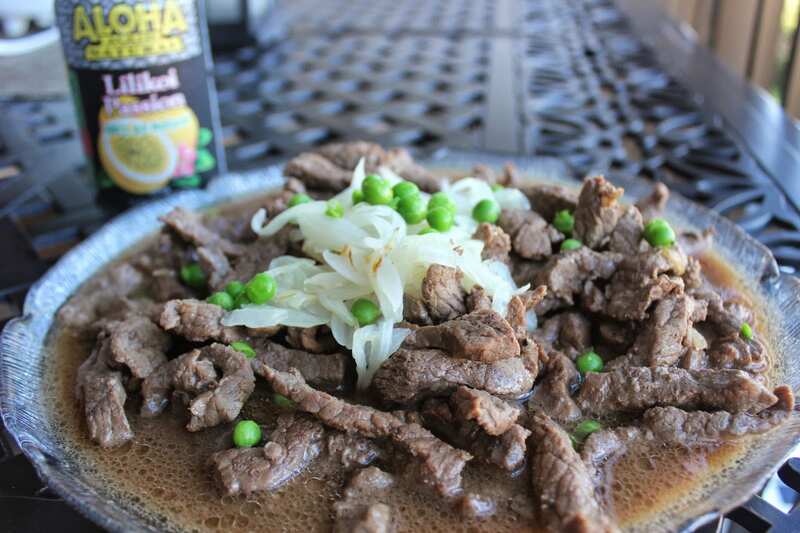 the kids, their favorite is this Filipino Bistek (or Beefsteak). So easy to make. I marinated the beef in Aloha Shoyu, salt and pepper, and I also added 1/2 a can of Lilikoi Passion juice drink, why not? LOL. First, I sautéed the onions, then I set the onions aside. Then, the marinated beef went in the pan, and I just let it cook for about 5-7 minutes. That’s it. I served the beef and garnished it with the onions on top, and I happened to see green peas in the freezer, I thought it added a little green flair, so I added that on top. That was breakfast, including white/brown rice we cooked last night. Everyone was happy. Next up, we continued to get ourselves ready for the shoot. The motif today for the pics? Classic white, and khaki pants for the boys. We were at Kamaole Beach before 9am. We took hundreds of pictures of the kids. I was really in awe as to how big they’ve grown. Poor little kids, were subject to whatever angle, or pose, or situation we threw at them. 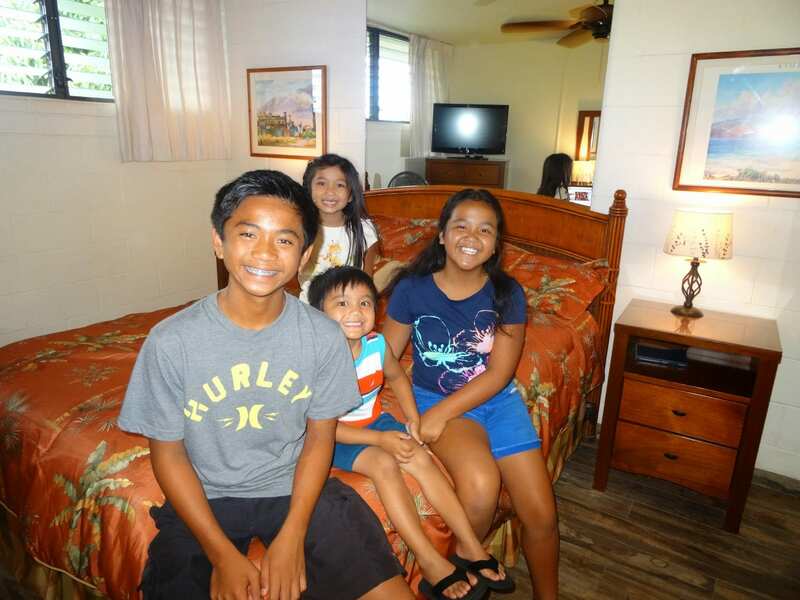 Cheese here….say Maui….say, stinky feet…anything to get them to smile. They were a big sport!!! Of course, there was a reward in between….a Fruit Roll-ups break, and the biggest reward of them all….jumping in the ocean! The picture taking session was not all that perfect. Evan got really tired of smiling with the sun in his face, so he stepped aside, but within a few minutes he rejoined his siblings. 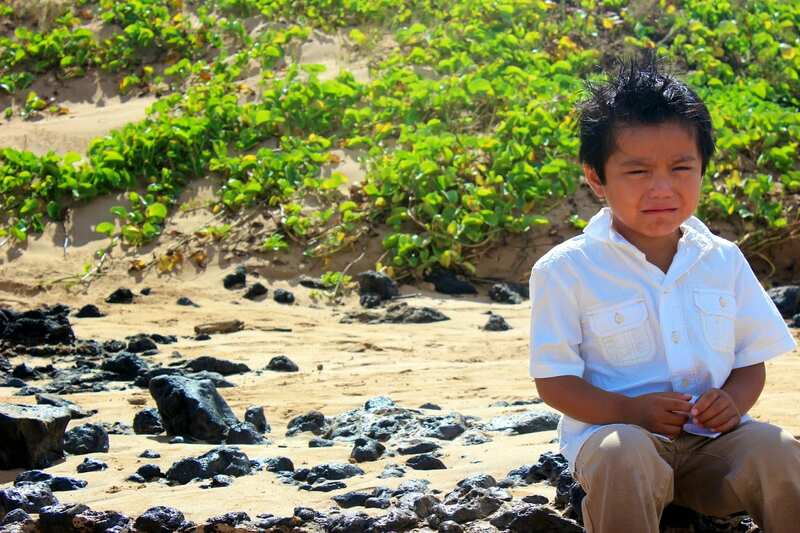 Maui 2014 Summer Pics….done!!! I’m tired, I wanna go swim!!!! Nancy took Evan and Caitlin upstairs back to the condo, while I played in the ocean with Madison and Ethan. We enjoyed every last bit of Maui’s spectacular ocean water. We took turns riding the body board, Ethan spent some time riding his skim board. Somewhere in between, gray clouds rolled in….then it showered, steady rain shower! We welcomed it. We don’t get this much rain or rain at all for that matter in Southern California. And I knew that this rain would only last a few minutes, I could see clear skies from afar, and sure enough, after 10 minutes…..sunshine! There was no time to drive around today, and we still had uncooked chicken. So, I decided to kick-up this chicken before frying it. I made a marinade mixture (shoyu, sesame oil, olive oil, salt n pepper, pancake syrup). What??? Yes, pancake syrup. I also added fresh garlic, rosemary and basil (from the herb garden). Put them all in mini food processor. I tucked in the mixture under the skin and all over the chicken. 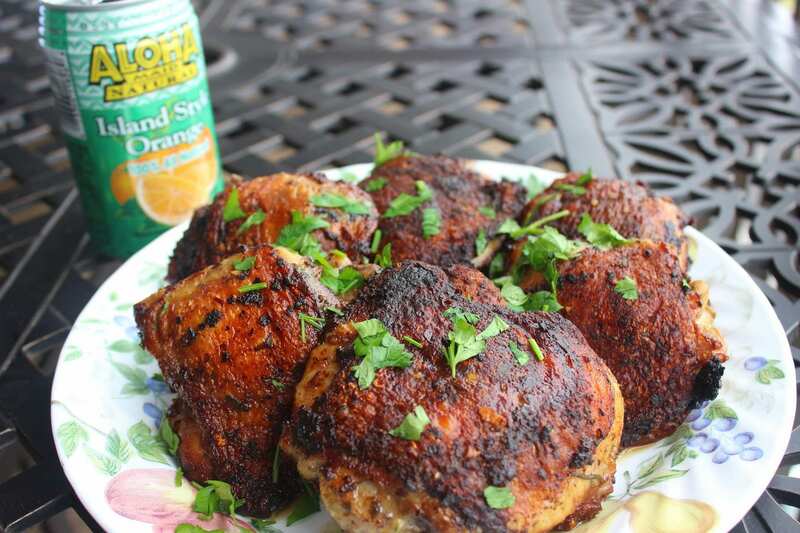 Threw the chicken thighs in the fryer…about 8 minutes each side…..that’s all she wrote! That was our lunch. 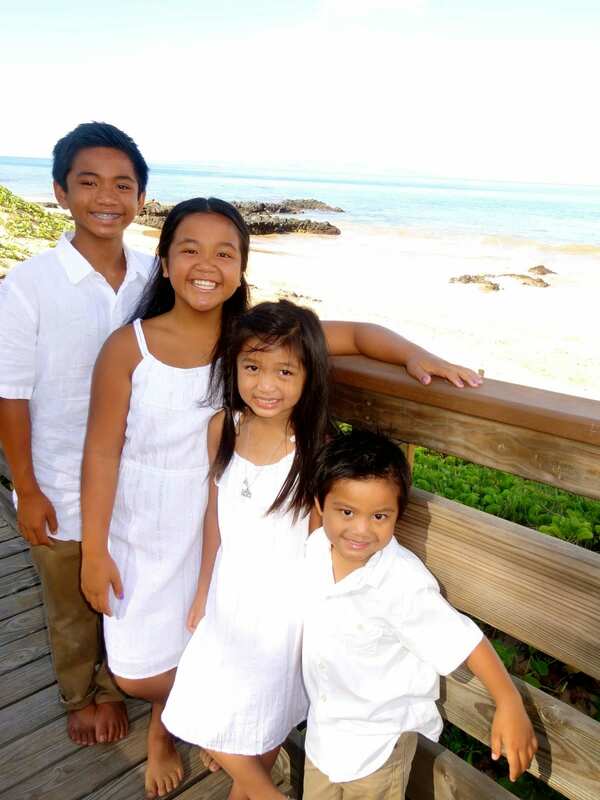 During our last vacation on Oahu back in April 2014, we stayed at the Ala Moana Hotel. 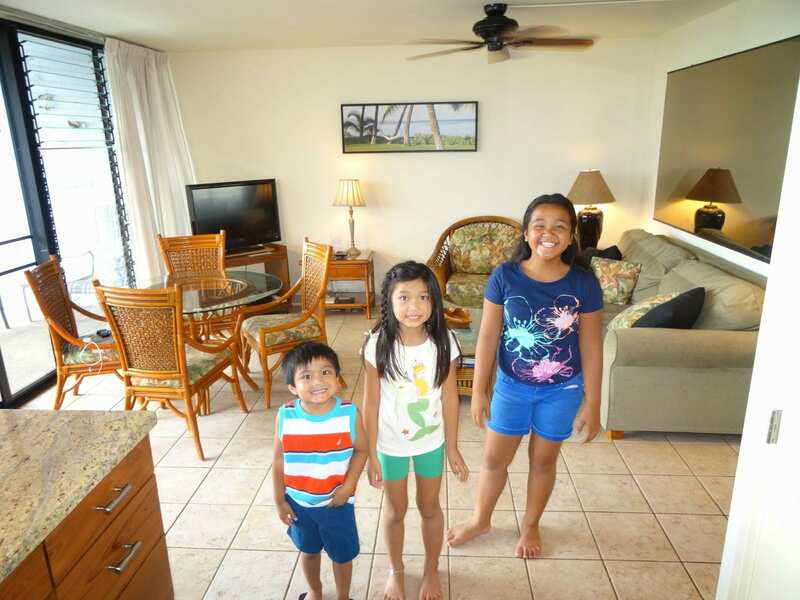 We also stayed at our timeshare (The Ilikai Resort, next to the Hilton Hawaiian Village), and we also spent a few days and took the kids to experience Disney’s Aulani). I knew that Maui won’t be as busy compared to Oahu, and I knew that for this trip I wanted to try and rent a condo. I had the option to use my Marriott Rewards, but I’ve got bigger plans for my points. Bigger than Maui? LOL!!! 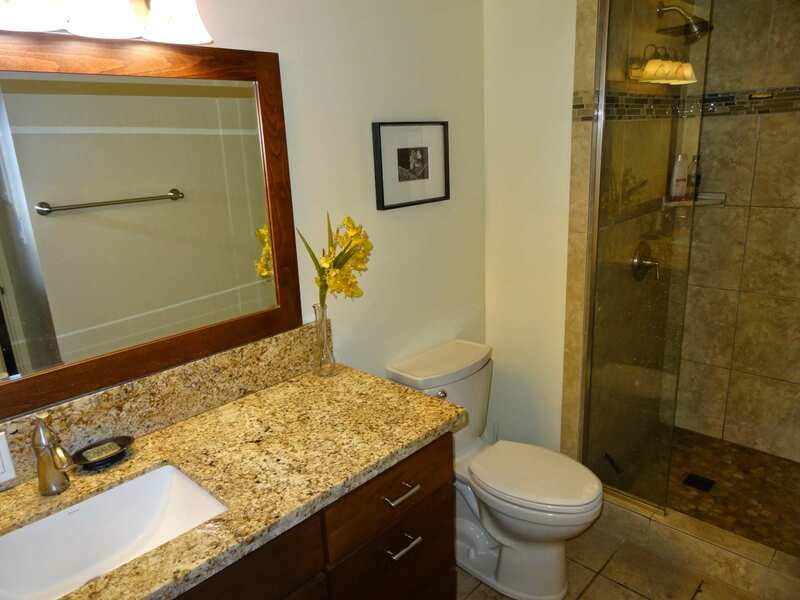 I wanted to have access to a kitchen, and laundry facilities inside the unit. I wanted enough room for all of us, so a 2-bedroom condo with a pull-out sofa sleeper would be ideal. I was also looking for a place that will not charge for parking. We all know that could add up. 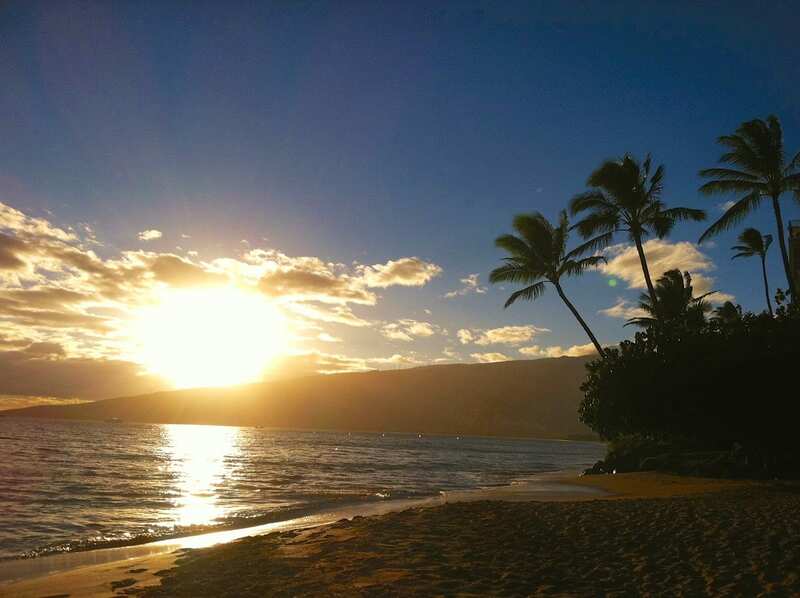 I started to look by using VRBO.com and found the listing for a unit in Maui Parkshore in Kihei. All the reviews I read had 5 out of 5 stars. That seemed so unbelievable. Was there a catch? I’ve never rented a condo before for a vacation, so I just trusted VRBO and my instincts. I placed back to back calls with the owner, and after 2 days of discussion, we agreed on our stay for 9 days. The place was perfect for us. We were on the top floor (4th floor). While we had access to an elevator, we were much closer to the stairs so we decided to get a “little bit” of exercise. The condo has no A/C. Was it an issue? When we first walked in around 7pm last Monday, I longed for an A/C. In fact, Nancy said, “Tomorrow, we’re going to buy a portable A/C.” But….but…but…the moment we opened ALL the windows, and turned on all the fans (there were probably 8 fans in the unit), and with the help of the Hawaiian breeze, who needs an A/C? Having the windows open also allowed us to listen to the birds, chickens, and the waves of the ocean. So having no A/C was not an issue at all. Once you enter the living room/kitchen area, your view directs you to the lanai…and you’re looking out to Kamaole Beach Park III, and a panoramic view of the trees, mountains and ocean. This was our home for 9 days. It was perfect for us. Perfect for our needs. end up buying or renting the basic necessities. We didn’t need to do that this time. All of these items were accessible to us at this condo – body board, skim board, beach chairs, beach umbrellas, goggles, and ice coolers. 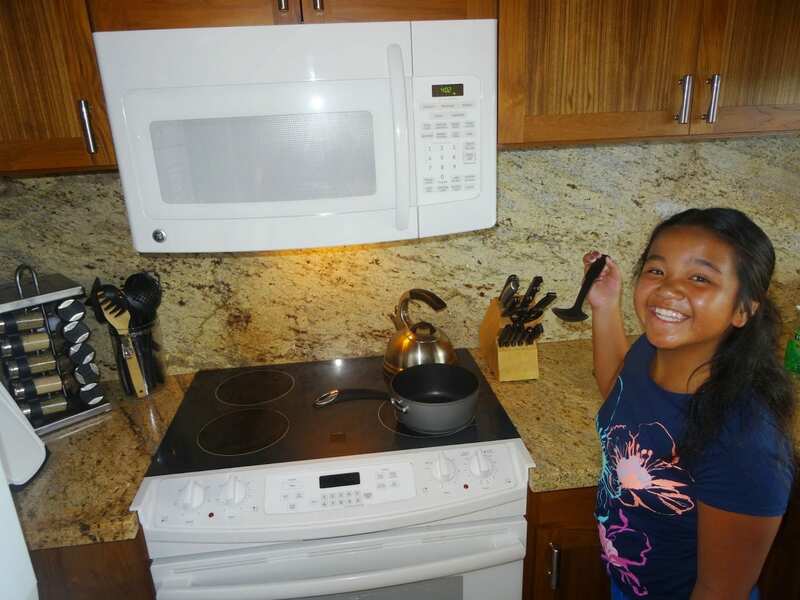 The kitchen had access to a great set of cookware, rice cooker (a must for us), toaster, blenders, and mini-food processor. Nothing was spared. Even the pantry was loaded with more than the basics. There were spice racks, vinegar, Shoyu sauce, olive oil, vegetable oil, pancake syrup. There was a stackable washer and dryer in the unit, and guess what else was provided? Laundry detergent!!! I kid you not. The linen closet had every towel imaginable – clean and very “white” bath towels, facial towels, and an assortment of beach towels. There’s Wi-Fi in the unit, and the speed was very decent. Although the unit offered 2 flat screen televisions, believe it or not, we were here for 9 days, and not once did we turn on the television, not once. Outside the condo, there’s assigned parking, a gated swimming pool, 4 gas or propane BBQ grills, picnic tables, outdoor showers to wash the sand away from your body, and an herb garden that was definitely put to good use by me. 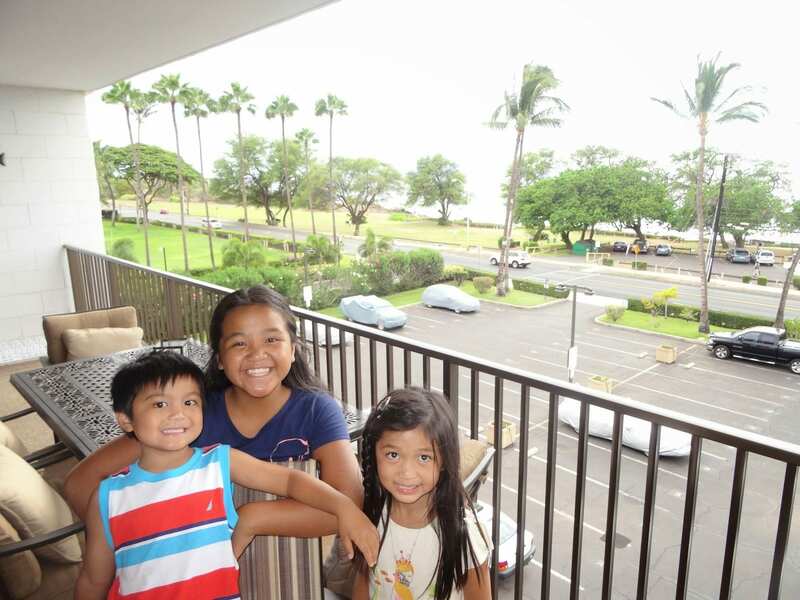 All the units had an ocean view from everyone’s lanai. Again, it’s directly located across the street from Kamaole Beach Park, a family friendly beach that’s great for swimming and snorkeling. As with anything, things will break, and we had no washing machine for 2 days. But all it took was a quick call to the owner, she was on it, got a technician to come out, and got the washing machine fixed. We were really fortunate to have stayed in this condo. And when we return to Maui, I’m hoping we can stay here again. We just couldn’t ask for anything more. Since we spent the remainder of the day in the condo, we finally left close to 5:20pm. Our flight was scheduled at 9:40pm, and we just had a few more errands before heading to the airport. One of which was a return trip to Ululani’s Shave Ice. Remember the early morning rain shower? Well that didn’t last very long. By the time we got to Ululani’s, it was hot and sunny again. We ordered Mango shave ice, and another one with Passion, Orange, Guava. It was the perfect thirst quencher. Shortly after getting our last shave ice, we walked across the street, and took pictures of our last sunset on Maui…a perfect way to seal the deal on our 2014 Hawai’i summer vacation on Maui. I mentioned earlier that we rented a full-size SUV, a Chevy Tahoe. 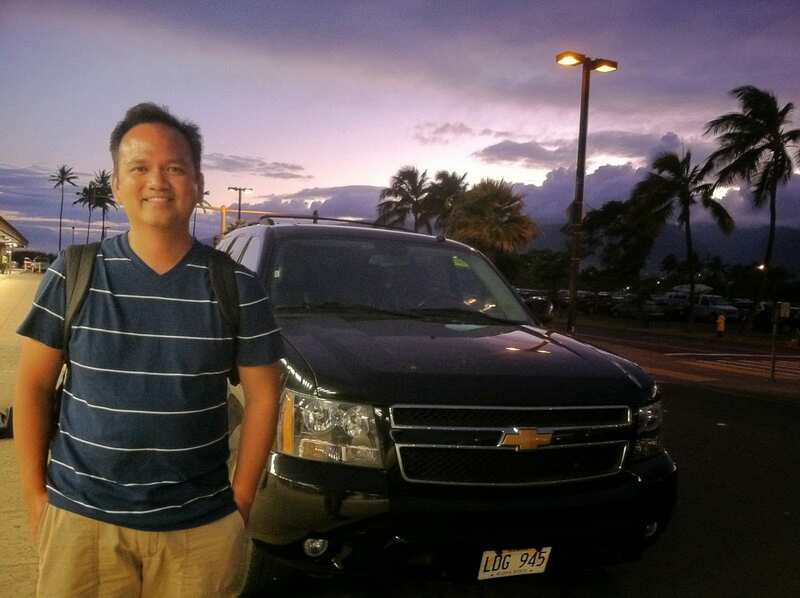 For the past few trips to Hawaii, we’ve been renting a minivan since we needed room for 6. With this last trip, I found out that I could rent a full-size SUV and pay significantly less than renting a minivan. I figured might as well try and drive something like a Tahoe or Suburban. There was no doubt, they were much bigger. But it worked for us. It was just difficult whenever I had to back-up. I am spoiled with my Honda Odyssey, I get to use a rear-view camera. So with this vehicle, my rear-view aid was Ethan, and when it came down to parking at tight spots (like the one at the condo), Nancy guided me for a few days, and I seemed to have mastered it as the vacation went along. Thank you, Tahoe. we had a great ride. Our party of 6 ended up with 6 carry-on luggage PLUS one checked-luggage. 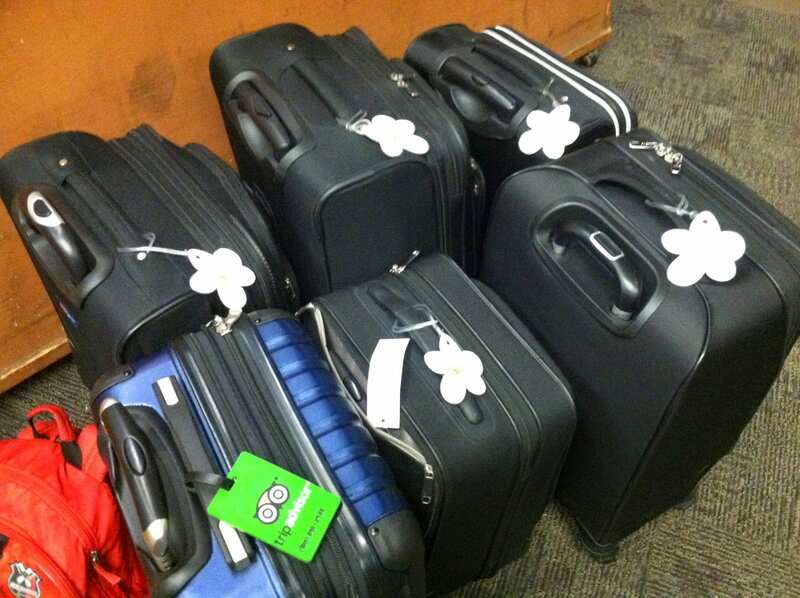 We didn’t have a checked luggage en route to Maui, but since we purchased Hawaii goodies, we needed another luggage. Nancy knew this was going to happen even before we left LA. So prior to our trip, she brought this sturdy, lightweight, travel bag that she folded and kept in one of our carry-ons. Although we had to check this luggage in, it was free of charge. Why? If you purchase your tickets using your Hawaiian Airlines Credit Card (which I did), you get 1 free checked bag. Other than that, we did quite well, keeping our carry-ons to a minimum, we brought what we thought we needed (and still we realized, we had clothes we brought that we ended up not wearing). We’re guilty when it comes to packing, or shall I say, overpacking. But I really believe we did well. We will get better…yes, we will. 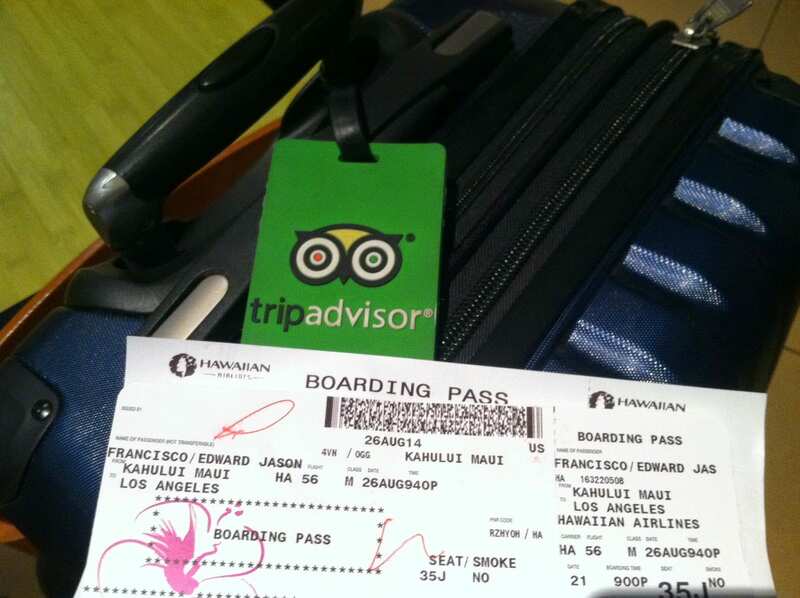 In the typical Francisco Family fashion, we took a red-eye flight back to LA. It was delayed for a 1/2 hour. We arrived just past 6am California time early Wednesday morning. We were on the road by 6:30am, ready to conquer the grueling 405 and 101 Freeways. And if you’re familiar with these two freeways, you know that it was trouble that we were asking for. To our surprise, NO TRAFFIC. Simply unreal. And this was during rush hour. We arrived at home at 7:40am… the kids hit the shower (actually, we all took a quick shower). Why??? It’s their FIRST DAY OF SCHOOL!!!! Yes!!! We knew we’d be cutting it close….very close. We didn’t think they’d make it to school before their 1st period….but they did!!! For that moment, it was all about family, and school at that point…back to reality. So what’s the takeaway? Was it the food? Was it the beaches? Was it the condo? Or, was it everything about Hawaii? It was all of that…but truly, it all boils down to the time we spent with the kids. About a month ago, Maui was not even in the picture. But we took a leap of faith, and made it happen. I will forever remember the Q & A, and random pop quizzes that Nancy and I asked the kids during our many-a-Maui road trips. Oh, and the songs and music we listened to. The kids took over the music selection. I usually play Hawaiian music like Hapa or Keali’i Reichel using Pandora or Spotify. But this time, they got to pick their songs. 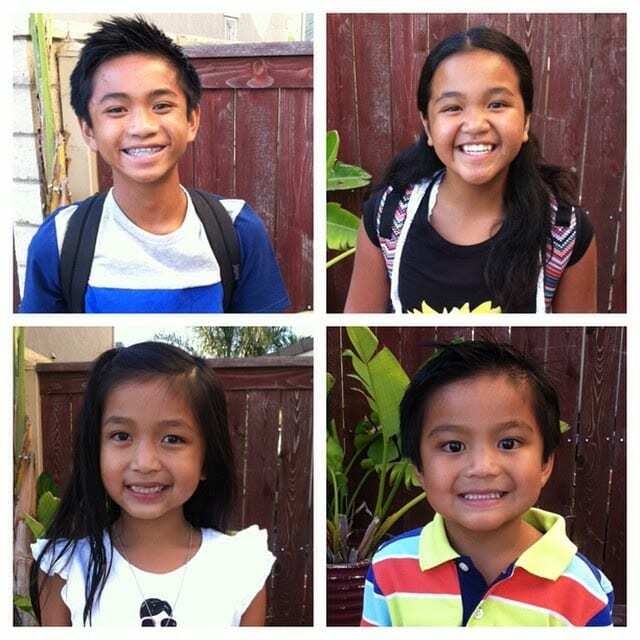 Fresh from their trip to New York, they enjoy listening to songs from 2 Broadway shows – Matilda and Newsies. Those songs became the soundtrack of our Maui vacation. These kids are growing fast each day. There will come a time when they’re going to want to do their own thing. I’m hoping to savor these moments more and more. Ethan (13 yrs old) is now an 8th Grader, and I know in 3 years he’ll be driving. Madison (soon to be 11 yrs old) just started middle school. Caitlin (8 yrs old) is now a 3rd grader, and little brother, Evan (5 yrs old), is now in Kindergarten. We are blessed to have the opportunity to take them on vacation with us, and we will continue to do so. What’s the next adventure? I know I have be in New York 2 or 3 more times this year, for work, but for these kids….only time will tell. For now, mahalo Maui. Thanks to all of you for following our journey. Maui no ka oi!